Washington, D.C – Parents, Families and Friends of Lesbians and Gays (PFLAG) National praised members of Congress today for the House and Senate passage of legislation (HR 6520/S 4023) that will lead to the end of the discriminatory “Don’t Ask, Don’t Tell” policy that excludes openly gay individuals from serving in the U.S. military. “Don’t Ask, Don’t Tell”, a policy signed into law by President Bill Clinton in 1993, dictates that gay and lesbian servicemembers may serve in the U.S. military and will not be questioned regarding their sexual orientation. However, they must not disclose their sexual orientation or risk discharge. It is estimated that since the law’s implementation in 1994, more than 12,000 servicemembers have been discharged under this policy. “This isn’t the end of the battle for the legislation. We’re now looking to President Obama and military leaders to take the next steps to officially end ‘Don’t Ask, Don’t Tell’ and send the message to the country that we honor and welcome our men and women in uniform for their dedication to their country, regardless of their differences,” said Huckaby. From SLDN: Gay and lesbian servicemembers still at risk. Parents, Families and Friends of Lesbians and Gays (PFLAG) is the nation’s foremost family-based organization committed to the civil rights of gays, lesbians, bisexual, and transgender people. 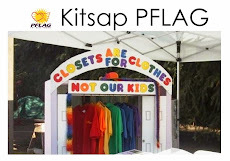 Founded in 1973 by mothers and fathers, PFLAG has 200,000 members andsupporters in more than 300 chapters.